It is reported that Indian dealers of US based car maker General Motors are planning to sue the company in US court over the issue of insufficient compensation over the point of sale (PoS) investment made by the dealers on behalf of car maker by the end of ongoing year. To liquidate its existing stock parked at the yards of dealers the car maker is offering discount up-to 30% on its vehicles. 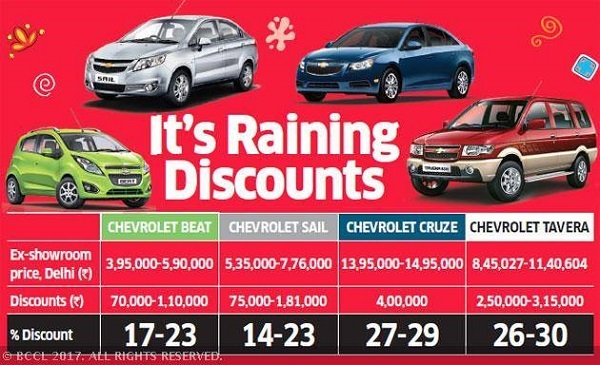 In a meeting with its partners the sources of GM India said that the discount strategy determined by the company will help in rolling out about 1800 to 1900 vehicles standing at the dealerships throughout the country apart from 800 cars parked in stable of company. Commenting on the existing scenario one of the principal dealer of Chevrolet said, “The company has told us it will compensate the dealers for the losses on account of these discounts, but on condition that we purchase vehicles in stock at the plant. Financial institutions have blocked limits on inventory funding since the GM announcement on May 18. So, even if we want to, it is difficult for us to make additional purchases,” Recently a meeting was held between the officials of General Motors and its dealers to discuss the strategy for liquidating the existing of company at the earliest. After analyzing the strategy determined by the car maker to compensate its dealers, the Dealer Advisory Board (DAB) with 15 representatives are evaluating the opportunities for taking action against the US car maker as most of the dealers are not happy with offer made by GM. According to one of the dealers General Motors is offering Rs. 75 lakh as compensation for the total investment of Rs. 6 crore invested for establishing the showroom. According to him, there are three options on which dealers are planning to sue to the company some are planning to file civil suits, those who have invested money in setting up green field showrooms are thinking for filing criminal case while there are some who are planning to suit company in the United States of America. Commenting over the situation spokesperson of GM said that the company is having discussion with the dealers and discussing these discussions publicly will not be appropriate.